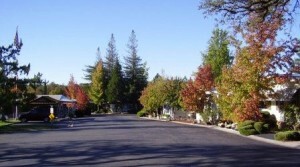 Rock Creek Mobilehome Community is dedicated to being a true community for seniors (at least 55 years of age) who seek a simpler lifestyle in a beautiful Gold Country location. Typically, it is important to our residents to have their own home and yard, but not too much of either. They are glad to have a welcoming social life on tap just outside their door and just as glad to opt for the privacy of quiet evening at home. It is a wonderful neighborhood in which to walk or bike and be active; and a strategic location to easily access all aspects of the dynamic Northern California lifestyle. 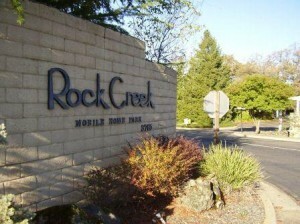 Rock Creek is truly a beautiful residential community. Great care was given in the development of the community. We felt that the streets should be gentle and spacious and that there be ample space for a park, community gardens, a club house, a recreation center, an aquatic facility with pool and spa, a dog park, off-street guest parking, and secure storage space for recreational vehicles. Rock Creek Mobilehome Community continues today under the attentive care of the Baumer Family and the professional management team that they have assembled. If you would like to learn more about our community and what it has to offer you or your loved ones, please contact us today and let our professional management team assist you with your questions and needs.